WorldWorksGames • View topic - Would You Like to See... ? Would You Like to See... ? Post subject: Would You Like to See... ? The first (and easiest) is my cornered wall treatment for CastleWorks Ultimate that I used for my Thann Kor Keep project [ see here: viewtopic.php?f=5&t=12249 ]. 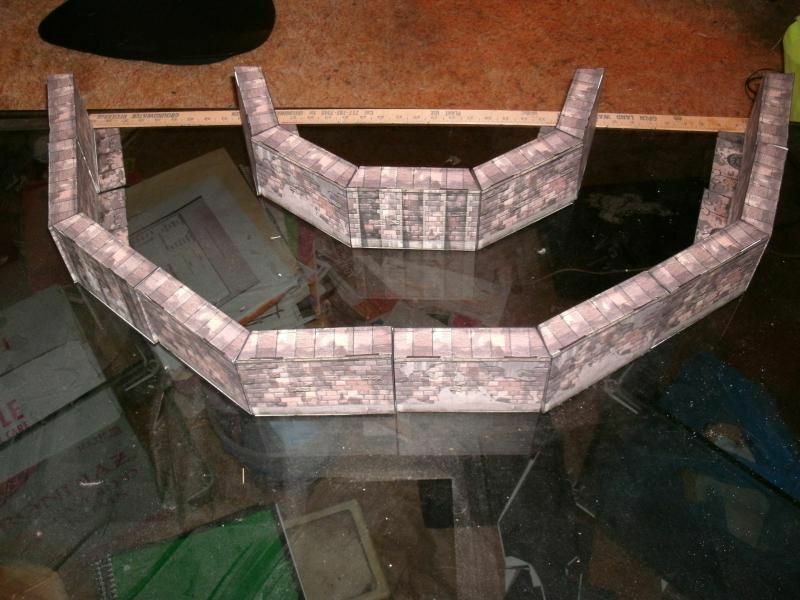 This is where I angled the walls to give a rounded/curved outline for the battlements. Perhaps this is too simple a tweak to the existing artwork to justify submitting, but I'll let the community give me some input here. The second is a TLX treatment of Chris Roe's Podtel. This involves making the basic pods as architectural 'standouts' for the sides of modern/future buildings to give a more 3D effect beyond simple verticle slab walls. I started work on this a long time ago when it first came out, but my GIMPing expertise then was practically zilch. I never finished and now I'm wanting to start over fresh to give it a better treatment. There's a couple other things I want to try, including neo-gothic architectural elements for TLX bulidings [read: "building trim"], but I want to start on these first. As I said, just looking for input as to whether you all would think these "wantable". Post subject: Re: Would You Like to See... ? I like the looks of the Castleworks Ultimate stuff you did. I'd like the chance to build that sort of set. My advice would be to take what you think is most complete, or most likely to be completed, and run with it. I think your projects sound really cool! Those angled walls for CWU are great - yes, please. What you're talking about doing with the Podtel sounds interesting. While I can't see myself building the Podtel version (just not something I'm likely to use), mastering the integration of swift scenics and TLX components has got to be a good thing. I'd give the Castleworks Ultimate Kitbash a try if it was submitted. 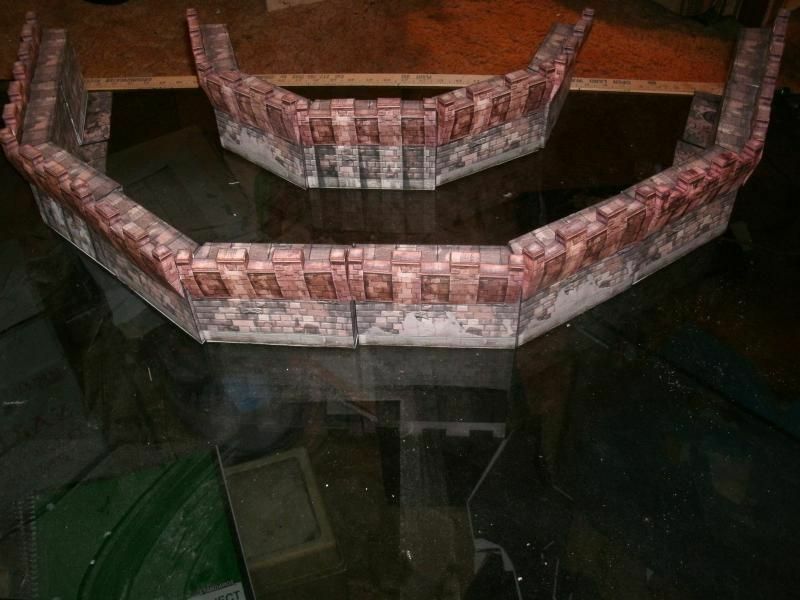 I've finished converting the four standard 6" walls (just the Castle Wall, not the Tower or Building Walls - those are not within the scope of this project); and the 1" replacement top walks; and am currently finishing up the ground bases. Note: this is all for the angled walls creating a convex bastion wall similar to what I created for Thann-Korr Keep where five angled walls make a half-circle - but you can add standard straight walls between them to create a longer wider arc. Next on the list is converting the 3" walls (which should run quickly now that the hard basics are finished). Caveat: the canted/angled end(s) are still 1.5" wide, which makes the overall wall depth just slightly under that so that the canted ends meet up exactly with the standard wall ends. ... Then I'll test build to make sure this all works properly before submitting. After that I will start on the *concave* version set group. 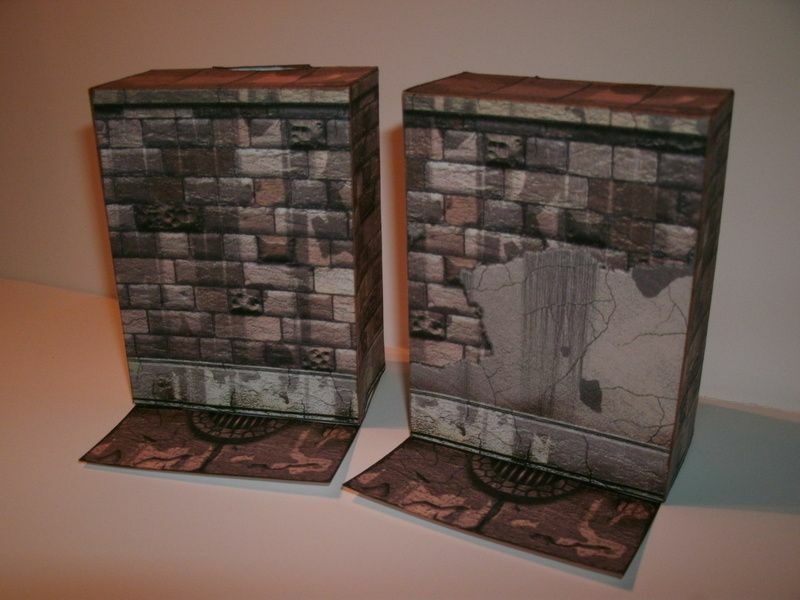 Now, I could do this as a group of whole walls (the interior side would extend a half-inch to either side), - OR - I could just modify the CWU Columns to create angled add-ons for the Standard Walls, thus greatly reducing the cardstock printing necessary to use this kitbash. What do you guys think? Second question: Should the Concave and Convex Angled Walls be submitted as a single Kitbash or two separate ones? The next step in my series will be a set of (more) simple 45-degree walls - both Convex and Concave. At the moment, I'm intending this to be a separate Kitbash submission -- unless the community consensus would be to wrap *all* of these alternate walls as one big Kitbash? Somewhere along the lines I am also wanting to create an archway wall for each these, as well as an angled Gatehouse... Like all Kitbashes, it just keeps getting bigger an bigger in scope. I'm not dead - at east not yet, anyway - nor is the project. Having finally scrammed through the Holidays, and the usual RL distractions clammaring for my time, I'm at last ready to print out the 6" angled castle walls for a test build before submission. And that's exactly what WAS going to happen today - before realizing the cost of getting it done at Staples. At $1.09 per page (on a better sheen cardstock than I normally use for my builds), the test build would me run me about $85 ! ... ... ... Uhmm - no! So, as soon as I find an in-home printing solution with one of my friends, I'll get this test build done. It will consist of a full 'circle' of 10 x 6" walls (outside measurement), with mounting bases (at the same angle) to preserve the 'portable modularity' of the original CWU set. The submission will contain not only the 6" walls, but also left- and right-handed versions for those wishing to go Mega and need/want a 12" wall run per section. All versions have the four wall textures: plain, stucco, ridged and ridged/stucco. There will also be a pass through wall, and an angled gatehouse. Then I plan on contributing separately a 3" wall version for those wanting a smaller curving wall. Beyond that, a 45-degree wall version of the 6" walls. [Hmmm, now who owed me one of those favors...] Yeah, yeah, I know - the 'Soon' Factor. Beta-build complete... pic of both the small (6" walls) and large version (12" run per segment made of two 6" walls - one with a left angle end, and one with a right). For fun, I just could not resist throwing on complex crenelations (from my Thann-Korr Keep build - hence the red hue). Unfortunately, I am going to have to hit the drawing board again. The small version works out to a 20" diameter (outside-to-outside) instead of a nice 18". I think I'll edge the size up a hair so it reaches 21". (Reducing the size might necessitate making a special complex crenelation so they would fit.) The large version has a 39" diameter, which although not a nice 6" multiple, is a 3" multiple - so I will leave that as is. p.s. Fixed the image links. FYI, you can use the 'quote' function to see how it's done. I will have to put forth the caveat that the crenelations make the pieces a bit wobbly/top-heavy. A weight will be recommended to be glued inside the wall along the 'inside' side to compensate. No particular comments, except that I'm longing to see it submitted! If the walls have small holes in them to accommodate bobby pins, it would help secure them together and prevent any tipping. Are they designed that way? No, the only designed holes are the original slots for crenelations -- but I can do that. I'll just have to refer back to some of the earlier sets that used this technique. Do you recommend inserting the bobby pins from below or above? Personally, I prefer the hidden (below) version as it looks better, but it does need to sit flat and those with more experience with bobby pin builds may have better suggestions. If you put in the bobby pins from the bottom, you have to lift the entire piece to put it together (or take it apart). I think you should put them in from the top -- that also lets you add them as you go if it turns out you need more support. Black bobby pins hide pretty decently in a build like this. I say, if you use them, go from the top. That way you also have gravity helping hold them in place. 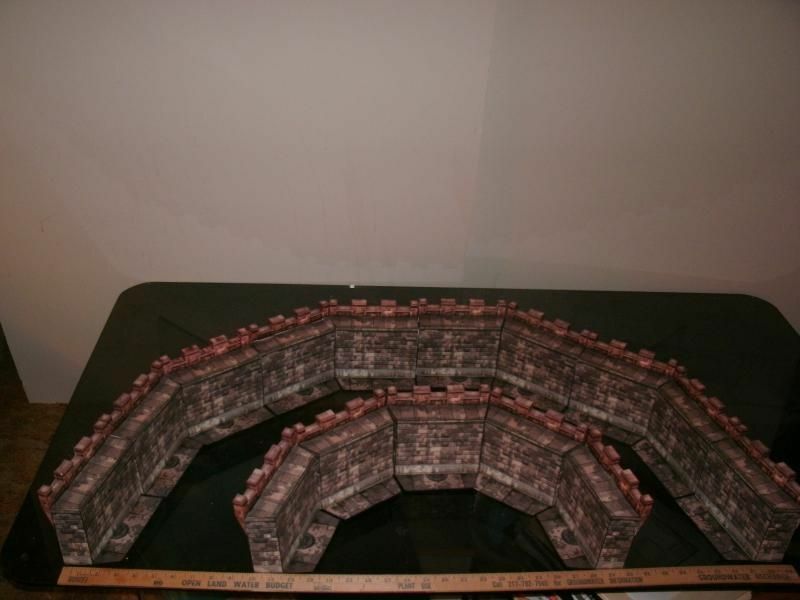 Phase One of my CWU kitbashes has just now been submitted: 3-inch Walls and Crenellations. 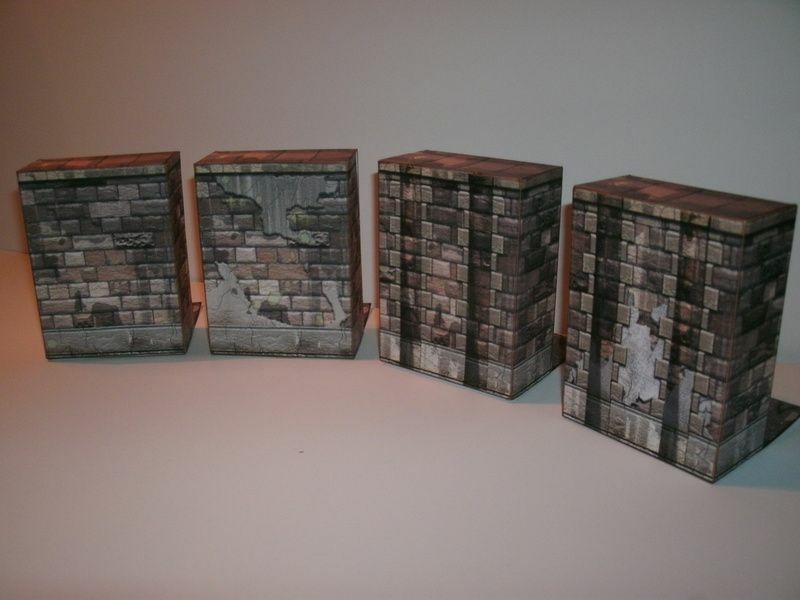 I had to backtrack to this, because I wanted the 3-inch crenellations available when the other phases come through. 1. The existing inner wall (plain) has been supplemented with a Stucco version to better accompany the Stucco and Ridged-Stucco exterior wall textures. Both inner walls have been modified to accept a "slot-in" crenellation similar to those for the 6-inch walls. 2. Three new exterior wall textures have been generated to reflect the Stucco, Ridged, and Ridged-Stucco walls found in the original 6-inch sizes. 3. An alternative "flat" (easy) crenellation with two upper and one lower portions of cren has been generated, to augment the single upper / two lower portions as originally provided. 4. 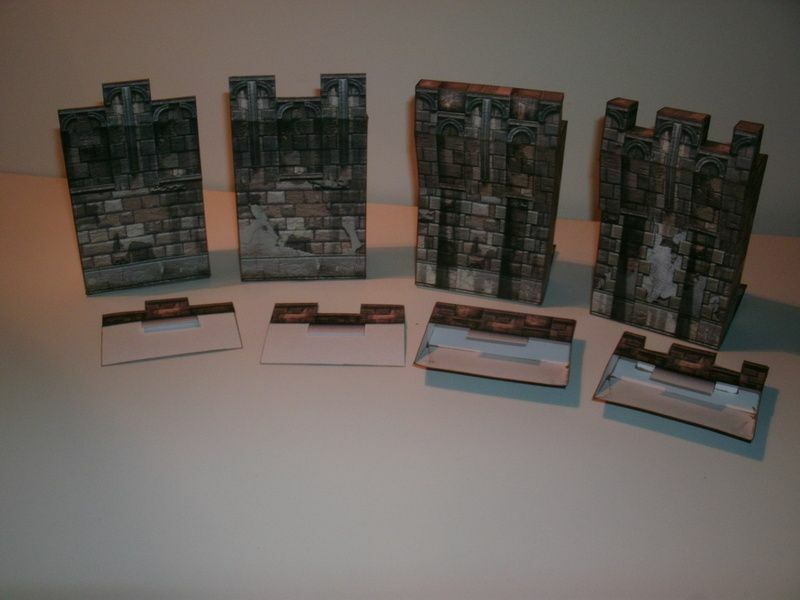 3-inch long Moderate and Complex crenellations have been generated from the original 6-inch versions. Everyone have a great Holiday this weekend! I don't have an email yet, but it might just be hung up in the internet due to size or something. I look forward to having a closer look soon. Great. Looking forward to these getting through the kitbash system. Great looking bash! Like the design! Though I am still working on the first of several angled walls for CWU (where the ends are cut on a bevel), the kitbash which will probably become my actual second submission is my Podtel TLX treatment. I wanted the 'pop' of modern architecture 3D walls as a counterpoint to the basic 'flat' TLX walls. So I took the 'nose' of Chris Roe's Podtel pods and stuck TLX tabs on them. 'Course, I knew I needed all the matching posts, and standard 'flat' concrete walls mirroring the Podtel surfaces (3 different variants), and concrete floors (all 3 types) ... and I just remembered while out driving today that I need to do anchors as well. 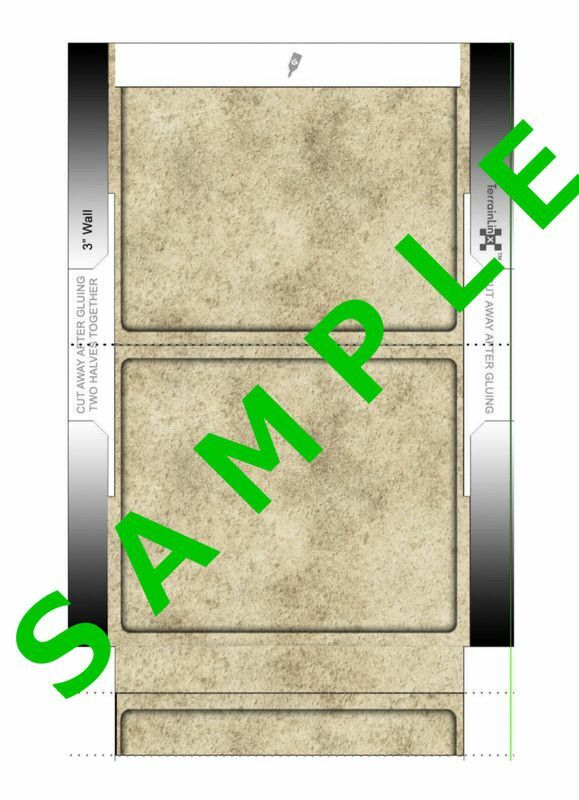 Plus, there will be fascade versions with a floor extending either 1" and 1.5". A nice, small enough kitbash style set - but wait, there's more! There will be the bonus MEGA version where the walls are a full 3-inches across to cover the entire front edge of a 3x3 tile (or half a 6x6). This is because I see a lot of modern architecture elements coming directly off from the buliding corners. Yes, there will be a corner post with specially notched 'outer corner'. Today, I just finished the basic fascade itself, the basic standard corner post, and one of the wall styles. As soon as I get done with this post, I'm hitting the cutting board as samples of these are already printed. That sounds awesome! Can't wait to see it! Wondering if I need to give a bit more border around the depression edge before the edging. What do you all think? I think a bit more would be a good idea. It will help account for marker bleed when people edge.